There are actually two interwoven storylines focusing on two different characters in Someone Like Me. First, there’s Liz, a single mother whose ex-husband is an abusive creep. Second, there’s Fran Watts, a 16-year-old girl who’s known at school as a freak. Ever since a bizarre and traumatic abduction ten years earlier, Fran has suffered from a host of symptoms of mental illness, and fears that she’s just plain crazy. During a particularly bad encounter with her ex, when he turns violent and seems on the verge of killing her, Liz finds herself responding by bashing Mark with a broken bottle — but she’s not the one controlling her own body. Someone else seems to be pulling the strings, and yes, it saves her life, but it also leaves her terrified. Meanwhile, Fran is accompanied by an imaginary friend, a fox known as Jinx, who has been with her ever since the kidnapping and who’s always ready to protect her. And sometimes, Fran sees the world change — the color of a blanket or a figurine or something else in the background will change from one thing to another. Desperate, Fran returns to her psychiatrist to beg for stronger meds, anything to make these hallucinations go away. When Fran sees Liz and her teen-aged son Zac at the clinic as well, a strange connection is forged between the two teens, and they start to discover that the oddities in Fran and Liz’s lives may be linked. 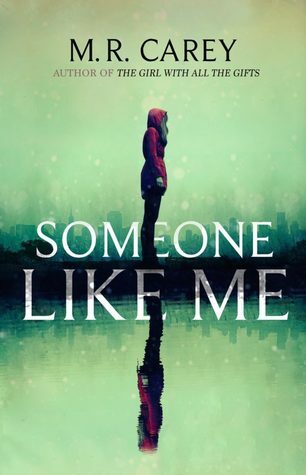 Someone Like Me is a gripping story of psychological terror. We alternate between Liz and Fran, seeing their world views and the (figurative) demons they each battle. Each is desperate to just live a normal life, and fears that she’s losing her grip on sanity and reality. Of course, there’s something else going on here, and it’s weird and scary — and neither Fran nor Liz feel that they’ll be believed if they find a way to describe it to anyone. At 500+ pages, Someone Like Me is a bit longer than it needs to be. Some of the chapters, particularly the chapters focused on Liz and her family and her struggles, seem overly long, and the story takes a while to really build up steam. Still, it’s worth sticking with. By the halfway mark, the plot really picks up and the crazy twists become more and more absorbing. M. R. Carey knows how to tell a fast-moving story with great action sequences. I loved The Girl With All The Gifts. This book doesn’t quite measure up, possibly because it’s a story set in our day-to-day world, with just a taste of supernatural/mysterious forces/unexplained phenomena, whereas The Girl With All The Gifts was a marvelous example of horror world-building, creating an entire post-apocalyptic new world order for the characters to navigate. But leaving the comparisons aside, Someone Like Me is very good, very creepy, and very inventive. Definitely check it out if you enjoy stories of psychological horror and twisty mindgames!